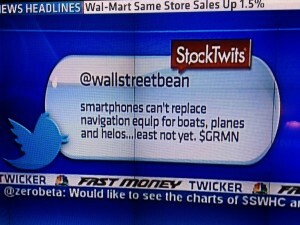 Garmin was a hot stock in 2005 and 2006. I owned it (see my blog archives). Location was hot. Really hot. At the top of it’s run, Garmin $GRMN traded up past $120. Than, Nokia bought Navteq (another company I owned) and the top was put in. The iPhone made GPS in your pocket ‘the thing’ and Garmin was forgotten. Until last year. My friends on @stocktwits, Daniel Miller and Jason Robinson, started writing about the stock being a value in the 30’s. They are self taught guys and of course they work hard at their craft. I have been watching Garmin because I know they own the skies and cockpits. The momentum has been creeping in. I love Stocktwits because a large group of investors and traders are discovering other large group of traders and investors and we are meeting the people on the opposite side of the trades. The people that are thinking the exact opposite of us. It has not led to fistfights. Just respect. Hard to value all this for sure, but sometimes I don’t care. It’s about some wins and some smiles and some backslapping.